It’s no secret fine dining will be a centerpiece attraction of The Yard at Fishers District, but high-quality restaurants aren’t the only upscale pieces coming to the new development. 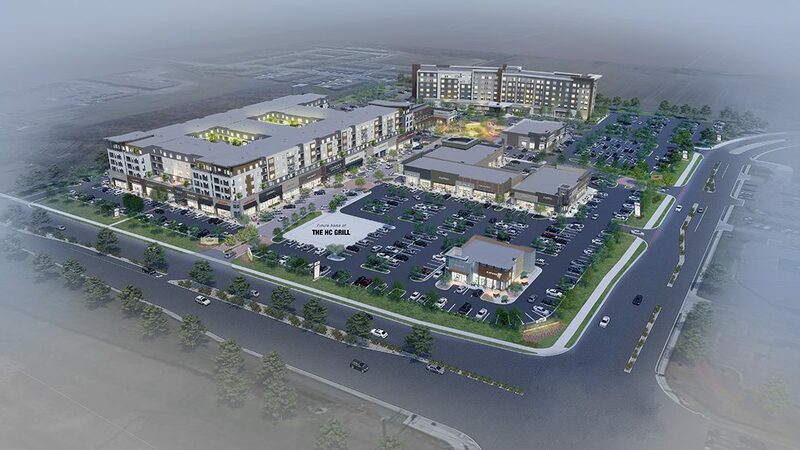 “Originally, it was just mostly restaurants, but as it developed, (the developers) found you can’t just have a mixed-use development that only has food,” said Chelsea Hudelson, retail marketing coordinator for Thompson Thrift Retail Group, which is developing the project. The Mark is a multi-family apartment building under construction within The Yard at Fishers District development. The first floor will feature retail shops. Residents will live above in the 260 units, which include studios and one-, two- and three-bedroom apartments. A pet-washing station, state-of-the-art fitness center, pool, aquatic center, spa and bike racks are among the amenities. Pre-leasing will begin in the second half of 2019, but a price range has not been determined. 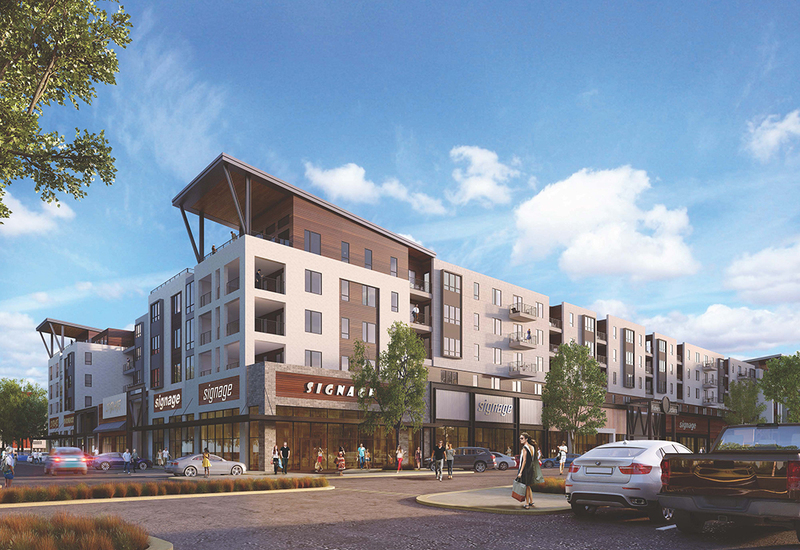 Jessica Landez will lease retail space at The Yard at Fishers District. She is the owner of BluePeppermint Boutique, which operates out of a multi-story house at 8936 South St.
“I jumped on The Yard because I do think it’s going to be a great space,” Landez said. Landez cites an anticipated increase in pedestrian density for moving her business. The new one-story BluePeppermint Boutique will be approximately the same size as its current two-story building. Landez said she will try to incorporate the boutique’s charm into the new layout. Landez plans to move the business next summer. Several other businesses have followed her lead and also signed leases at The Yard at Fishers District. Sun King Brewing Company, an Indianapolis-based craft brewery with three locations – one small-batch brewery in Fishers, one in downtown Indianapolis and one in Carmel. 1933 Lounge (by St. Elmo) is a restaurant/bar concept by St. Elmo. The proposed location at Fishers District will be its first location outside of downtown Indianapolis. THE HC GRILL, which is a St. Elmo concept in the works, reportedly serving Americana-style food. HC stands for Hamilton County. A Culinary Incubator, which will occupy 3,000 square feet of the space within Sun King Brewery. This area is for startup chefs to introduce their menus. Havana Cigar and Cocktail Lounge, an upscale cigar bar and cocktail lounge. Verizon Wireless, an American telecommunications company. Massage Heights, a membership-based therapeutic services franchise that offers massage and facial services. Sangiovese Ristorante, an authentic Italian restaurant. Sangiovese’s first location operates at the Iron Works development on the north side of Indianapolis. Amazing Lash Studio, the nation’s largest eyelash extension services franchise. Rawkin’ Juice, a fresh food and juice concept offering cold-press juices, organic vegan salads and pure energy smoothies. Kincaid’s Meat Market, a full-service butcher and meat market that has operated its north side Indianapolis location since 1921. Nicey Treat, a local frozen treat retailer with locations in Broad Ripple, Fletcher Place, and the Nicey Mobile that travels to farmer’s markets and other events. Hyatt Hotels parcel, which encompasses 4.17 acres. The Dunn Hospitality Group plans to open a dual concept Hyatt Place and Hyatt House in this location with approximately 210 rooms.